Every year LibraryThing members participate in “SantaThing,” our Secret Santa for book lovers. This year we’re inviting Littens to join in! The idea is simple: You sign up and pay $15–50 and choose your favorite bookstore. We match you with someone to pick books for, and someone else will pick books for you. We try to match people with similar reading tastes, and members help each other out with suggestions. LibraryThing staff does all the ordering and everyone gets surprise books for the holidays! LibraryThing/Litsy takes no cut: this is a community project, not a money-maker. And it’s a lot of fun. The first 20 Littens to sign up for SantaThing will get a free Litsy mug! (1) Mugs will be coming to the LibraryThing store soon. But you’ll get them first of anyone. Go ahead and Link your Litsy account to a existing LibraryThing account, or create a new one. Wait, what? Link your account? Yes. You can now link a Litsy and LibraryThing account. At present, it does almost nothing but enable SantaThing and give you a web page that summarizes some of your Litsy reading. It will do more soon! Questions about SantaThing? You might find this post about SantaThing helpful. 1. We’re defining Litsy members as members who posted to Litsy at least once in the last 14 days—this to favor regular Litsy members, not LibraryThing members who signed up for Litsy once upon a time. If there aren’t enough of these, we’ll open it to any Litsy member. SantaThing 2018: Bookish Secret Santa! It’s the most wonderful time of the year: the twelfth annual SantaThing is here at last! What’s SantaThing? SantaThing is “Secret Santa” for LibraryThing members. » SIGN UP FOR SANTATHING NOW! You pay into the SantaThing system (between $15–$50), and pick your favorite bookseller. 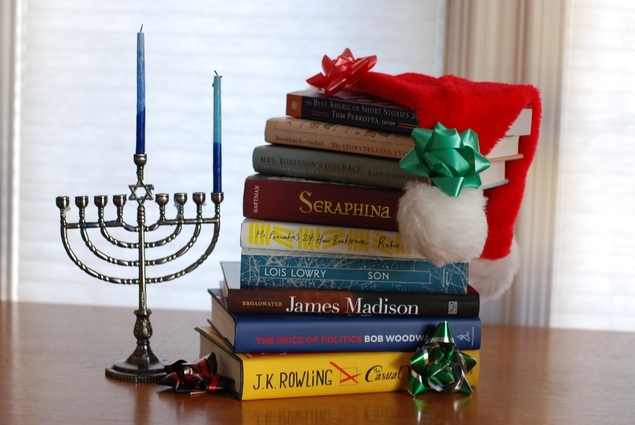 We match you with a LibraryThing member, and you play Santa by selecting books for them. Another Santa does the same for you, in secret. LibraryThing does the ordering, and you get the joy of giving AND receiving books! Sign up once or thrice, for yourself or someone else. Even if you don’t want to be a Santa, you can help by suggesting books for others. Click on an existing SantaThing profile to leave a suggestion. Every year, LibraryThing members give generously to each other through SantaThing. If you’d like to donate an entry, or want to participate, but it’s just not in the budget this year, be sure to check out our Donations Thread, run once again by our fantastic volunteer member, mellymel1713278. Sign-ups close WEDNESDAY, November 28th at 12pm EST. By Wednesday evening, we’ll notify you via profile comment who your Santee is, and you can start picking books. You’ll then have a week to pick your books, until THURSDAY, December 6th at 12pm EST. As soon as the picking ends, the ordering begins, and we’ll get all the books out to you as soon as we can. Every year we tweak SantaThing a little. This year, we’re thrilled to be partnering with Print as our official local SantaThing store once again. Print is a great indie bookstore located in Portland, ME (not far from LibraryThing HQ!). Other new additions: Amazon.de has expanded their free shipping options, which is good news for all. Sadly, Audible still doesn’t allow for the gifting of individual audiobooks. I know that was a big disappointment last year. If you’d like audiobooks, be sure to say so in your SantaThing profile, and your Secret Santa can select CD copies of those from your store of choice. Just like last year, the Kindle option is available to all members, regardless of location. So long as your Kindle is registered on Amazon.com (not .co.uk, .ca, etc. ), you can elect to receive your SantaThing gifts as Kindle ebooks. See more information about Kindle and SantaThing here. This is our TWELFTH year of SantaThing. See the SantaThing Help page further details and FAQ. Feel free to ask your questions over on this Talk topic, or you can contact Loranne directly at loranne@librarything.com. We’re pleased to announce that the eleventh annual SantaThing is here at last! Sign-ups close MONDAY, December 4th at 12pm EST. By Monday evening, we’ll notify you via profile comment who your Santee is, and you can start picking books. Picking will last until MONDAY, December 11th at 12pm EST. As soon as the picking ends, the ordering begins, and we’ll get all the books out to you as soon as we can. Every year we tweak SantaThing a little. This year, we’re thrilled to be partnering with Print as our official local SantaThing store. Other new additions: Barnes & Noble and Walmart are joining our list of booksellers, which also includes Powell’s, Book Depository, Apple iBooks, and Amazon (including national ones). You can choose to have your books picked and sent from any of these stores at any and all price points. Feel free to ask your questions over on this Talk topic. You can contact Loranne—the LT staffer who runs Santathing—at loranne@librarything.com. SantaThing 2016—Bookish Secret Santa—is here! We’re pleased to announce that the TENTH annual SantaThing is here at last! Sign-ups close SUNDAY, December 4th at 5pm Eastern. By Monday morning, we’ll notify you via profile comment who your Santee is, and you can start picking books. Picking has been EXTENDED until Monday, December 12th at 1pm Eastern. As soon as the picking ends, the ordering begins, and we’ll get all the books out to you as soon as we can. Every year we tweak SantaThing a little. This year, we’ve got a couple of new stores to choose from: Barnes & Noble Nook and Audible are joining our list of booksellers, which also includes Powell’s, Book Depository, Apple iBooks, and Amazon (including national ones). Once again, we’re happy to have Portland’s own Sherman’s Books & Stationery as our official local SantaThing store! You can choose to have your books picked and sent from any of these stores at any and all price points. Feel free to ask your questions over on this Talk topic. You can contact Loranne—the LT staffer who runs Santathing—at loranne@librarything.com. You’re also always welcome to reach us at info@librarything.com. SantaThing 2014: Play Secret Santa with us! We’re pleased to announce that the eighth annual SantaThing is here at last! Done this before? SantaThing sign up is now open! UPDATE: SantaThing sign-ups have been extended! Sign-ups close MONDAY, December 1st at 9pm Eastern. By Tuesday morning, we’ll notify you via profile comment who your Santee is, and you can start picking books. Picking closes Monday, December 8th at 12pm Eastern. As soon as the picking ends, the ordering begins, and we’ll get all the books out to you as soon as we can. Every year we tweak SantaThing a little. This year we’re happy to have Portland’s own Sherman’s Books & Stationery, Powell’s, Book Depository, and Amazon (including national ones) as our booksellers. You can choose to have your books picked and sent from any of these stores at any and all price points. We’re also please to extend the Kindle Only option to all members, regardless of location. So long as your Kindle is registered on Amazon.com (not .co.uk, .ca, etc. ), you can elect to receive your SantaThing gifts as Kindle ebooks. See more information about Kindle and SantaThing here. Feel free to ask your questions over on this Talk topic. As always, you’re welcome to email us at info@librarything.com. 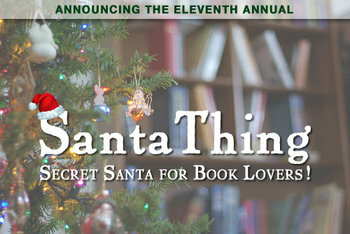 Remember to sign up for SantaThing, our “Secret Santa for book lovers.” Sign-up closes 8PM Friday (Nov. 29). Welcome to the SEVENTH ANNUAL SantaThing! Done it before? Sign up is now open! The idea is simple: You pay into the SantaThing system (choose from $15–$45). You play Santa to a LibraryThing member we pick for you—we try to match up similar members—and you select books for them. Another Santa does the same for you, in secret. LibraryThing does the ordering, and you get the joy of giving AND receiving books! You can sign up as many times as you like, for yourself or someone else. If you sign up for someone without a LibraryThing account, make sure to mention what kinds of books they like, so their Secret Santa can choose wisely. Sign-ups close Friday, November 29 at 8pm Eastern. Saturday morning, we’ll notify you via profile comment who your Santee is, and you can start picking books. Picking closes Thursday, December 5th at 12pm Eastern. As soon as the picking ends, the ordering begins, and we’ll get all the books out to you as soon as we can. There’s no guarantee that we’ll have books to you by December 25th, but we’re going to do our best! Every year we tweak SantaThing a little. This year we’re happy to have Longfellow Portland’s own Longfellow Books, Powell’s, Book Depository, and Amazon as our booksellers. At any and all price points, you can choose to have your books picked and sent from Powell’s Books, Longfellow Books, Amazon.com (including national subsidiaries: .uk, .ca, .de, .fr, .it, .es). or BookDepository.com. Book Depository ships to the most number of countries (see the full list), but they can’t promise your books will arrive before Dec. 25th. Important note about Amazon: Amazon’s minimum for free shipping jumped up to $35 this year, so, if you want paper copies from Amazon, you will get $5 less in books than you pay—paying $30 will get you $25 worth of books. This does not apply if you select “Amazon Kindle Only,” OR if you go with the $40 or $45 price points, since shipping will be free. Aside from that, you don’t need to factor in shipping. (Except for Amazon, booksellers have promised to waive that for us.) Unlike some years ago, there’s no profit “cushion” built into this for us, although we expect under-orders to pay for situations where the shipping isn’t free. We do this for fun, not money. Ebooks are available again this year, but again, only via Amazon, and only for US members. We’re sorry to limit it, but ebooks are complicated in terms of rights and availability outside the US. Ebooks also don’t come with shipping costs, so this is one way to avoid the Amazon shipping issue, without having to go up to $40 or $45. Reminder: SantaThing Signup Closes November 29, 4 p.m.! Quick reminder: signup for SantaThing 2012 closes at 4 p.m. EST tomorrow, Thursday November 29th! Go here to sign up, or feel free to browse the list of Santas and make suggestions! Also see the Talk thread where generous LTers are sponsoring others so that they can participate in SantaThing this year. 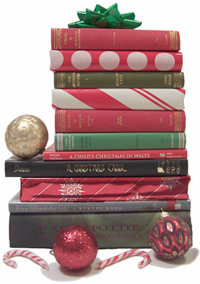 SantaThing 2012: Play secret Santa to a book lover! We are delighted to announce the sixth annual SantaThing! What is SantaThing, you ask? SantaThing is Secret Santa for LibraryThing members. Go ahead and sign up now. The idea is simple. You pay into the SantaThing system (choose $15, $20, $25, $30, $35, or $40). You play Santa to a LibraryThing member we pick for you*, and choose books for them. Someone else (secret!) does the same for you. LibraryThing does the ordering, and you get the joy of giving AND receiving books! You can sign up as many times as you like, for yourself or for someone else. If you sign up for someone without a LibraryThing account, make sure to mention what kinds of books they like, so their Secret Santa can choose wisely. Sign-ups close Thursday, November 29 at 4pm Eastern time. Shortly afterwards, we will tell you who you are matched up with by sending a profile comment and you can start picking books. Picking closes Thursday, December 6th at 12pm Eastern time. As soon as the picking ends, the ordering begins, and we’ll get all the books out to you as soon as we can. There’s no guarantee that we’ll have books to you by December 25th, but we’re going to do our best! > > Go sign up to become a Secret Santa now! The details. Every year we tweak SantaThing a little. This year we’re thrilled to be able to involve Portland’s own Longfellow Books as one of the bookstore choices. We’ve also adjusted the payment levels given the demand from last year, adding $35 and $40 options and removing the little-used $10 option (it also proved very difficult to find a book that hit that price point well). Like last year, though, you choose to pay what you want: if you pick $15, for example, someone will pick $15 worth of books for you. Choose $30, and someone will pick $30 worth of books for you. If you choose the $15, $20, or $25 options, you can choose to have your books picked and sent from Powell’s Books, Longfellow Books or BookDepository.com. Book Depository ships to the most number of countries (see the full list), but if you’re located outside the UK, they can’t promise that your books will arrive before Christmas. You don’t need to factor in shipping. There’s also no profit “cushion” built into this for us, although we expect under-orders to pay for situations where the shipping isn’t free. We do this for fun, not money. We’re allowing folks to request e-books this year, but only via Amazon.com and you must live in the US. We’re sorry to limit it, but last year proved very tricky to manage in terms of rights and availability for e-books outside the US. That’s it. Go sign up now! Update: As in past years, LibraryThing members are sponsoring SantaThing gifts for others. You can join in the fun here. We love that our members do this: you all are awesome. *We match members based on the contents of their catalog, thereby matching you with a Secret Santa you share tastes with. In theory. No guarantees. **Restricting Amazon to the $30 option or higher is necessary because LibraryThing can’t get free shipping unless the gift totals $25 or more.